Protein is used by our body to build muscles. An appropriate consumption of protein is crucial and extra-helpful to muscle-building or losing body fat. Protein should make up 10-35% of your daily calorie intake. The primary source of protein is eggs and meat, but some grains like beans, edamame, and soba noodles also contain proteins at lower amounts. Some proteins are also healthier than others. Seafood: salmon, shrimp, tuna, etc. Meat: chicken breast, steak, etc. Processed meat: ham, bacon, etc. 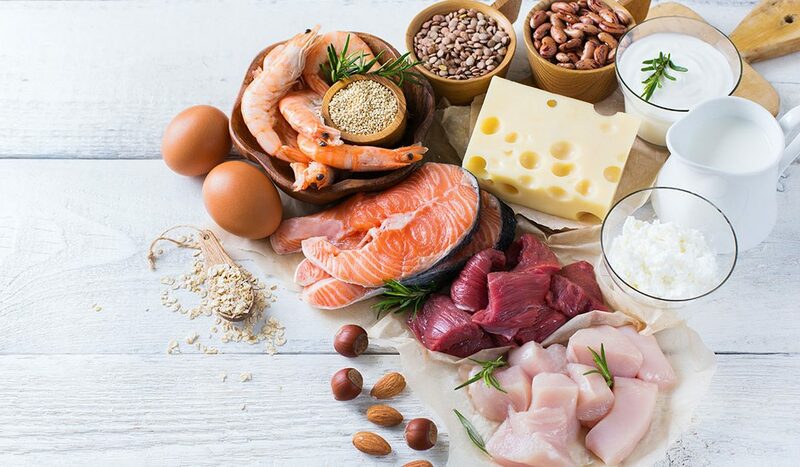 When choosing your source of proteins, one thing to keep in mind is to limit your intake of red meat to no more than 500g per week and try to avoid processed meat. While red meat is a good source for iron and vitamin B12, eating too much of it is associated with increased risk of heart disease and bowel cancer. Examples of red meat include beef, pork, and lamb. On the other hand, processed meat, such as ham and bacon, provide little nutritional value and may contain a large amount of fat and salt. Consumption of too much processed meat is also associated with higher risk of Type 2 Diabetes. The takeaway message is to limit your red meat intake and try to eliminate processed meat in your diet. Don’t forget to check out these quick and easy recipes and budget tips (1, 2, 3) to help you start eating healthier today!